OBRF3GD: 868 MHz radio module for ATEX 2 and 22 zones. Fitted with 3m shielded cable, for connection to the indicator. Power supply directly from the indicator. Work frequency from 868 to 870 MHz, which reduces the risk of interferences with the classic radio frequency systems. Pallet truck scale in Ex 2 or 22 area with manual transmission of the weight through OBRF3GD radio module to WeiMonitor PC software, in safe area. Weighing platform in Ex 2 or 22 areas connected to an ATEX weight indicator with transmission of the weight through OBRF3GD radio modules to repeaters at a distance, inside the same ATEX area. OBRF3GD-2 868 MHz radio frequency module for ATEX 2 & 22 zones. ABS IP66 case, 3 m shielded cable, and power supply from indicator. 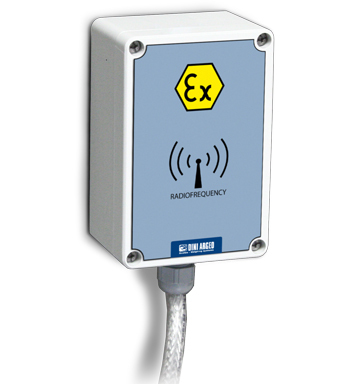 Protection: ATEX II 3G Ex ec IIC T6 Gc X for gases and ATEX II 3D Ex tc IIIC T85°C Dc IP66 X for dust. Max. functioning distance, in appropriate environmental and installation conditions: 70m indoors, 150m outdoors. 50 configurable channels.